Here's the video of yesterdays work, came out better than the last ones I think. I'm so surprised it's only been 3 working days since I started on the project! So much fun. 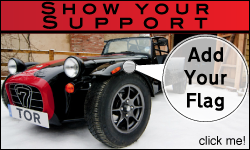 Cool blog sir - Are there any issues getting a Caterham approved in the USA for use on the road or are they the same spec as the UK Cars ? There are some, the main being emissions. You can get around them by buying a kit from Caterham US, but they don't come with engines. It'd be better to look it up, I'm in the UK so can't really be of any use :D.